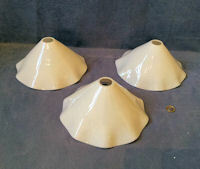 Original, quality set of three 1920's bell shaped plain but frosted glass electric light shades with rolled over outer rims. Will fit standard, modern, UK electric bulb holders. Complete and in good and working order. 5.5" tall and 5.25" widest. Original, quality 1920's multifaceted pressed glass lamp shade with a replacement, lacquered brass shade holder to fit a standard, modern, UK electric bulb holders. 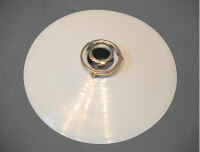 This example has a wavy outer rim and is complete and in good and working order. 4.5" tall x 7" diam. Original, quality set of three matching multifaceted pressed clear 1920's lamp shades with a replacement, lacquered brass shade holders to fit a standard, modern, UK electric bulb holders. This wavy edged example has one flake chip to the centre of the shade otherwise all is complete and in good and working order. 5" tall including holder x 8" diam. Original, quality circa 1900, clear glass gas lamp shade of a plain shape, with the original aluminium gas shade holder drilled out to fit a standard, modern, electric bulb holder. This example has the upper half frosted and the lower flared half clear. The shade holder is stamped "Nico No 48" and has been polished and lacquered and is complete and in good order. 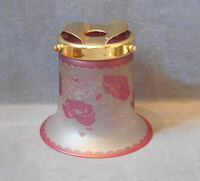 5.25" tall including holder x 5" widest. Original, quality late 19th century opaque coloured glass gas lamp shade, with the original aluminium gas shade holder drilled out to fit a standard, modern, electric bulb holder. This example has a hexagonal shaped lower half. The shade holder and screws have been polished and lacquered and is complete and in good order. 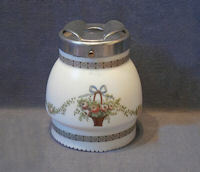 5.25" tall including holder and 3.75" widest. 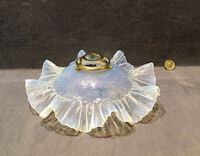 Original, quality 1920's bell shaped frosted and dimpled glass light shade with a frilly outer rim. Will fit standard, modern, UK electric bulb holder. Complete and in good order. 6" x 4.75" widest. Original, quality pair of 1920's clear glass bell shaped electric light shades to fit standard, modern, UK electric bulb holders. Complete and in good and working order. 4.75" tall and 5.25" widest. Original, quality late 19th century white and clear glass gas lamp shade with the original aluminium gas shade holder drilled out to fit a standard, modern, electric bulb holder. The shade holder is impressed "Tottenham" and has three brass bolts for grip and all is perfect and complete and in good and working order. 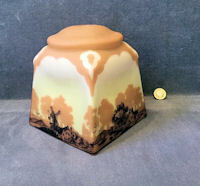 6.25" tall including shade holder and 6.25" widest. Original, quality set of six post-war continental frosted glass lamp shades. These shades have been fitted with replacement, lacquered brass shade holders to fit standard, modern, UK electric bulb holders. 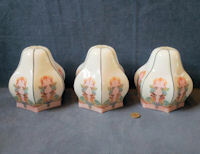 These examples have an embossed detail to the bell shaped body and a wavy flared end and are complete and in good order. 4.5" tall including holder and 5.75" widest. Price is per set. 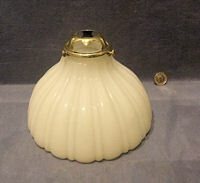 Original, quality 1920's vaseline glass electric light shade. 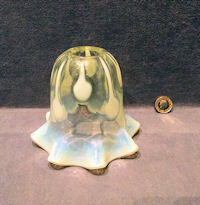 This bell shaped example has a vaseline colour to the upper section with drips and blobs running down and an opaline colour to the flared wavy lower rim. Complete and in good and working order. 4.25" tall and 5.25" widest. 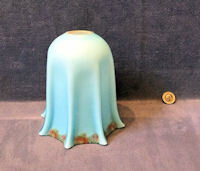 Original, quality 1920's bell shaped frosted glass electric lamp shade with hand painted floral decoration to the inside and a lustre bloom finish overall. Will fit a standard, modern, UK electric bulb holder and is complete and in good order. 5.75" tall and 4.25" widest. 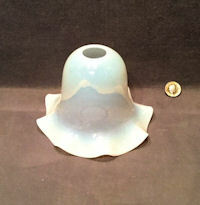 Original, quality 1920's bell shaped frosted glass electric light shade. Will fit a standard, modern, UK electric bulb holder. 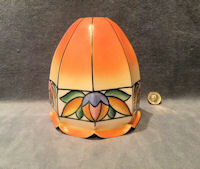 This example has six panels with an acid etched design to each and a flared outer rim. Complete and in good order. 5.25" tall and 5.25" widest. 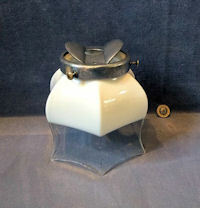 Original, quality 1920's six sided bell shaped electric shade with a frosted clear finish overall and a narrow band of clear glass to the outer shallow scallop rim. Will fit a standard, modern, UK electric bulb holder and is complete and in good order. 6" tall and 4.5" widest. 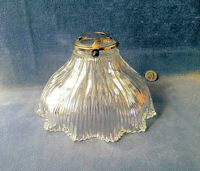 Original, quality 1930's square glass pictorial electric light shade. Will fit a standard, modern, UK electric bulb holder. This white glass example has a body colour of coffee brown on yellow on white and pictorial panels with windmills, trees and houses. Complete and in good order. 6" tall and 7.75" widest. 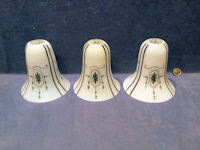 Original, quality set of three matching 1920's bell shaped white glass light shades with a green and black detailed design. The first we have seen of this model. Will fit standard, modern, UK electric bulb holders. Complete and in good order. 5.5" tall and 5.5" widest. 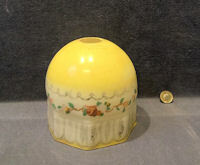 Original, quality 1920's yellow on white glass light shade in the form of a cloth shade with a band of fruit around and etched with "BC1 / Hailglass" and "British Made" for the manufacturer. Will fit a standard, modern, UK electric bulb holder and complete and in good order. 5.25" tall x 5.5" diam. 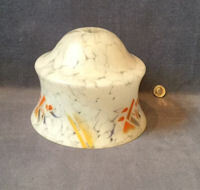 Original, quality pair of 1930's marbled glass electric light shades, white on frosted glass with orange and blue flecks. Will fit standard, modern, UK electric bulb holders. Two very minor chips to the rim, otherwise complete and in good order. 5.5" tall and 5.75" diam. 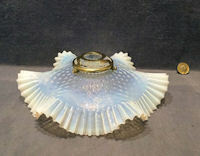 Original, quality 1920's bell shaped blue overlaid on white glass light shade with vertical ribs and floral decorations to the outer rim. Will fit a standard, modern, UK electric bulb holder and is complete and in good order. 5.75" tall and 5.5" wide. 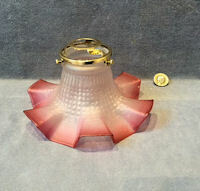 Original, quality 1920's bell shaped frosted glass electric light shade with cut decoration to the upper section and outer edge. Will fit a standard, modern, UK electric bulb holder. Complete and in good order. 5" tall and 5.5" wide. 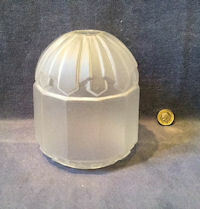 Original, quality 1920's / 30's frosted glass "hall lantern" shaped electric light shade. Will fit a standard, modern, UK electric bulb holder. Complete and in good order. 8.75" tall and 5" widest. 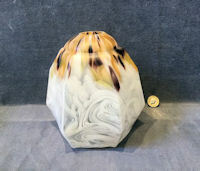 Original, quality 1930's glass electric light shade of an unusual shape with marbled effect of white and clear with traces of purple and green. Will fit a standard, modern, UK electric bulb holder. Complete and in good order. 6.25" tall x 6" widest. 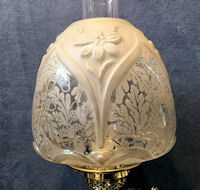 Original, quality 1930's glass electric light shade with an eight sided form and a marbled effect of white and clear with floral decoration of roses around. Will fit a standard, modern, UK electric bulb holder. Complete and in good order. 5.25" tall and 6" widest. Original, quality 1930's glass electric light shade with a six sided form and a marbled effect of white and clear with floral coloured detail to two sides. Will fit a standard, modern, UK electric bulb holder. Complete and in good order. 5.5" tall x 7" widest. Original, quality 1930's glass electric light shade with a six sided form and a marbled effect with deep red and orange on white and clear. Will fit a standard, modern, UK electric bulb holder. Complete and in good order. 6.5" tall and 6.5" widest. 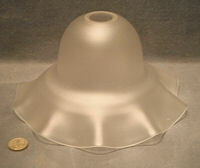 Original, quality 1920's frosted glass continental gas lamp shade. This shade has been fitted with a replacement, lacquered brass shade holder to fit a standard, modern, UK electric bulb holder. This example has a multi frilly and wavy outer rim and is perfect and complete. 10" diam, 3.5" tall including holder. Click on photo larger and other views. 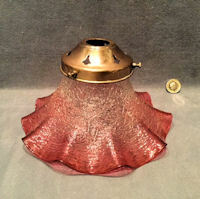 Original, quality 1920's cranberry tinted glass electric lamp shade. This super example has a fine cushioned texture, a wavy outer rim with the colour fading to clear at the top. Will fit a standard, modern, UK electric bulb holder. Perfect, complete and in good working order. 4.5" tall and 5.5" widest. 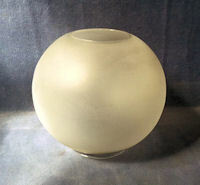 Original, quality 1930's acid etched white glass electric light shade, to fit a standard, modern, UK electric bulb holder. This example has a pale orange colour to the upper section and flower and leaf decoration with Horse Chestnut leaves to each alternate of the six panels. Complete and in good order. 5.5" tall and 5.5" widest. Original, quality pair of 1930's glass electric light shades with a six sided form and a marbled effect with deep red and orange on white and clear. Will fit a standard, modern, UK electric bulb holders. Complete and in good and working order. 6.25" tall and 7.25" widest. Original, quality 1920's / 30's heavily cut clear glass bellied shaped electric light shade, to fit a standard, modern, UK electric bulb holder. This good example has five different style of cut decoration and all is complete and in good order. 5.5" tall and 3.5" widest. Original, quality 1920's continental opaline coloured glass gas lamp shade, fitted with a replacement, lacquered brass shade holder to fit a standard, modern, UK electric bulb holder. This example has a fluted and wavy outer rim and is complete and in good order. 9" diam and 3" tall including holder. Original, quality 1920's continental opaline coloured glass gas lamp shade, fitted with a replacement, lacquered brass shade holder to fit a standard, modern, UK electric bulb holder. 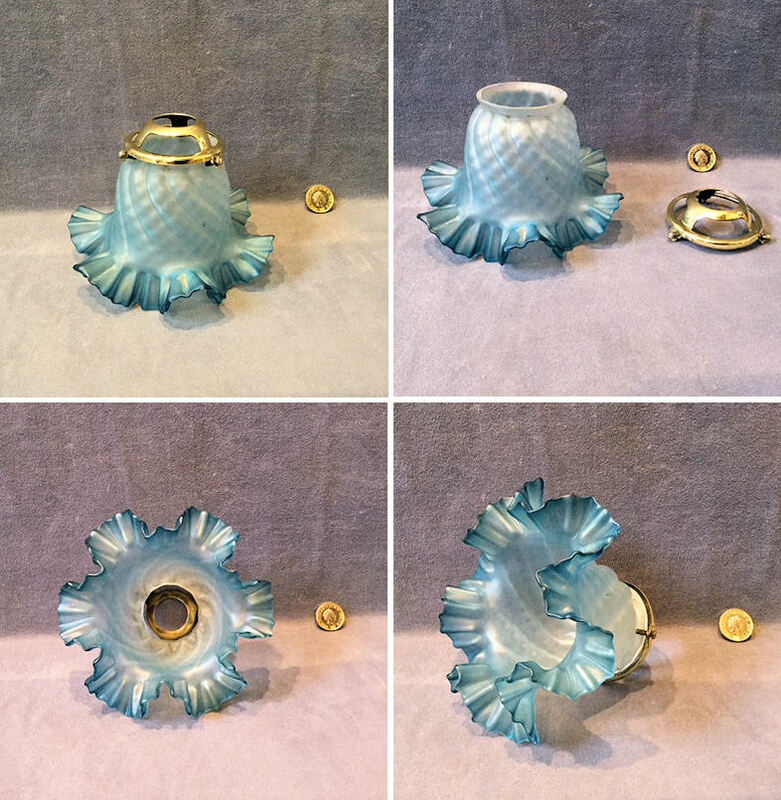 This example has a fluted and wavy outer rim and is complete and in good order. 10.25" diam and 3.5" tall including holder. 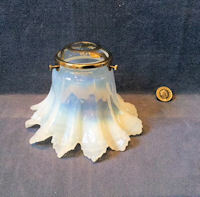 Original, quality 1920's continental opaline coloured glass gas lamp shade. This shade has been fitted with a replacement, lacquered brass shade holder to fit a standard, modern, UK electric bulb holder. This example has a fluted and wavy outer rim and is complete and in good order. 10" diam and 3.25" tall including holder. Original, quality 1920's continental opaline coloured glass gas lamp shade, fitted with a replacement, lacquered brass shade holder to fit a standard, modern, UK electric bulb holder. 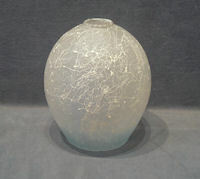 This example has a near white glass body fading through opaline to clear glass at the fluted and wavy outer rim. All is complete and in good order. 10.25" diam and 2.25" tall including holder. Original, quality multifaceted pressed clear glass light shade. This shade has been fitted with a replacement, lacquered brass shade holder to fit a standard, modern, UK electric bulb holder. This example was manufactured by "Holophane" patented 1909 and is complete and in good and working order. 5.25" tall including holder and 7.25" widest. 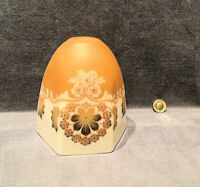 Original, quality 1920's / 30's white glass electric light shade, decorated in sepia brown designs and detailed to the top "Supastone Handpainted" and "Made in Czechoslovakia". Will fit a standard, modern, UK electric bulb holder and complete and in good and working order. 5.75" tall x 5.5" widest. 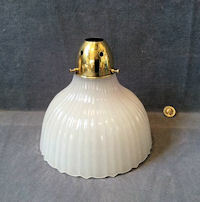 Original, quality 1920's continental opaline coloured glass gas light shade, fitted with a replacement, lacquered brass shade holder to fit a standard, modern, UK electric bulb holder. Will also fit an old 2.25" gas gallery, if required. This example has a flared and frilly outer rim and a dimpled body. All is complete and in good and working order. 4" tall with holder and 6" widest. 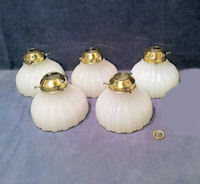 Original, quality set of four matching opaline glass continental gas light shades circa 1900; these shades have been fitted with replacement, lacquered brass shade holders to fit standard, modern, UK electric bulb holders. 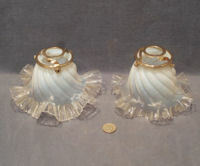 These examples have a bell shape with a wavy frilly out turned rim. Will also fit an old 2.25" gas galleries, if required. Complete and in good and working order. 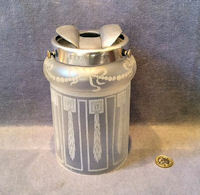 4.75" tall including holder and 6.5" widest. 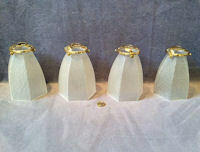 Original, quality set of five matching multifaceted pressed clear and frosted glass light shades. These shades have been fitted with replacement, lacquered brass shade holders to fit standard, modern, UK electric bulb holders. These unusual examples were manufactured by "Holophane" and patented 1909 and each shade is embossed beneath the top with the same details. Will also fit an old 2.25" gas galleries, if required. Complete and in good and working order. 4.5" tall including holder and 5.25" widest. 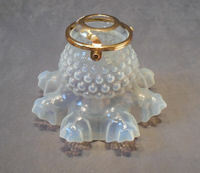 Original, quality 1920's / 30's moulded clear glass electric light shade. This shade has been fitted with a replacement, lacquered brass shade holder to fit a standard, modern, UK electric bulb holder. This is the first we have seen of this model. Complete and in good and working order. 6.25" tall including holder and 7.5" widest. Original, quality multifaceted pressed clear glass light shade. This shade has been fitted with a replacement, lacquered brass shade holder to fit a standard, modern, UK electric bulb holder. This example was manufactured by "Holophane" patented 1909 and is embossed beneath the top collar. All is complete and in good and working order. 4.75" including a holder and 6.5" widest. 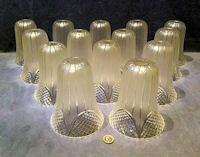 Superb set of fourteen original, quality matching frosted with cut glass 1920's / 30's lamp shades. Each shade of a bell shape has a frosted upper section with vertical cut glass lines and four lower panels of cut glass hobnail pattern. Will fit standard, modern, UK electric bulb holders. Not a blemish in sight and complete. 6" tall x 5" widest. Price is for the set. Original, quality moulded opaline glass electric light shade. This shade has been fitted with a replacement, lacquered brass shade holder to fit a standard, modern, UK electric bulb holder. 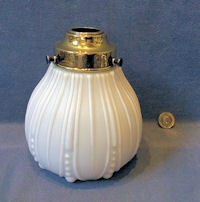 This example was manufactured by The Jefferson Lighting Co. of Canada for the UK market circa 1910. Complete and in good and working order. 5.25" tall including holder and 7.5" widest. Original, quality moulded opaline glass electric light shade. This shade has been fitted with a replacement, lacquered chrome shade holder to fit a standard, modern, UK electric bulb holder. 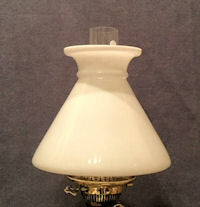 This example was manufactured by The Jefferson Lighting Co. of Canada for the UK market circa 1910. Complete and in good and working order. 6.5" tall including holder and 8.25" widest. 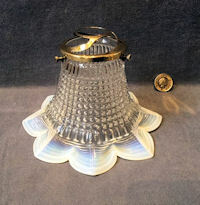 Original, quality 1920's, continental opaline coloured glass gas light shade with replacement, lacquered brass shade holder to fit a standard, modern, UK electric bulb holder and also fit an old 2.25" gas gallery, if required .This example is bell shaped with an eight soft pointed star shape to the outer rim with wavy edges and an overall embossed pattern. All is complete and in good order. 4.25" tall including holder x 6" widest. 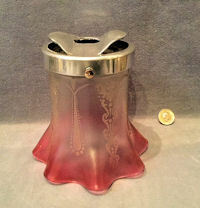 Original quality, 1920's, light cranberry tinted shade of art nouveau design. Will fit standard modern electric bulb holder. Complete and in good order. 5.5" high, 4.5" diameter. 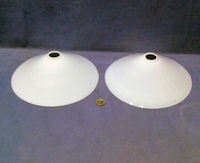 Original quality glass gas shades, with white upper and clear glass lower, circa 1900. Uplighters only. Fitted with new brass shade holders to fit modern, standard electric bulb holders. The brass shade holders have been lacquered. Complete and in good order. Various sizes ranging from 5.25" diameter x 6.25" tall to 6" diameter x 7.25" tall and 2.38" top aperture. Price is for each. When ordering online, please advise the approximate size required. Original quality, 1920's, white electric lamp shade with a pictorial on each of the four panels of fir cones and pine needle branches. Will fit a standard modern electric bulb holder. Complete and in good order. 4.5" square x 6" tall. 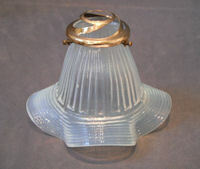 Original quality, 1920's, continental glass gas light shade for an uplighter only. This super pale blue opaline shade has a bright blue trim to the top rim and will fit a 2.75" gas shade holder and is supplied with a replacement, lacquered, brass shade holder to fit a standard modern electric bulb holder. this very unusual shade and is complete and in good order. Remember this is for an uplighter only. 2.7" high, 2.5/8" outer rim and 2.75" inner rim. Original, quality 1920's pink overlaid on white glass electric lamp shade decorated with swags of green leaves and red roses. This six sided example has a flute to each corner and will fit a standard, modern, UK electric bulb holder. All is complete and in good order. 5" tall and 5.25" widest. Original, quality, continental gas shade circa 1900, fitted with a replacement, lacquered brass shade holder to fit a standard, modern, electric bulb holder, but will also fit an old 2.5" gas gallery, if required. 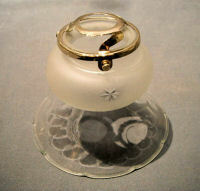 This example has a frosted top bulbous section with star cut designs and a clear glass flared lower part, with a petal shaped outer rim. Complete and in good order. 5.25" x 4" tall with shade holder and 2.25" top aperture. 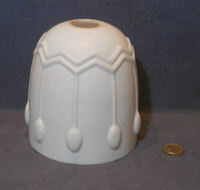 Original, quality 1920's continental, white glass 'Coolie' hat shaped lamp shade. This shade has been fitted with a replacement, laquered brass shade holder and will fit a standard, modern, electric bulb holder. Complete and in good order. 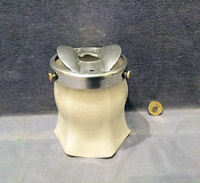 9.75" diameter x 2.25" tall including brass holder. 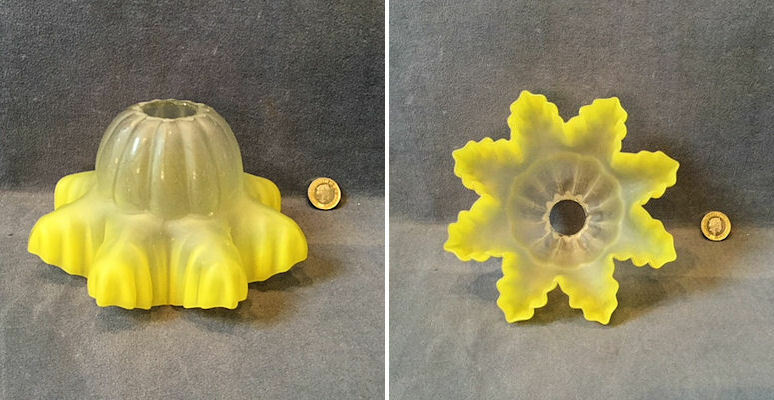 Set of three matching, original, quality 1920's, yellow tinted glass lamp shades to fit standard, modern, UK electric bulb holders. Each shade has an eight pointed star shape, with vertical ribbing and a strong yellow colour to the star shaped section fading to clear at the top. Some variations of colour strength between each shade, but identical in shape and all are complete and in good order. 6.25" widest and 3.5" tall. Price is for the set. Original, quality 1920's, circular enamel electric light shade in the 'coolie' shape, to fit a standard, modern, UK electric bulb holder. The upper surface is in Royal blue and the underside is white. Bright, clean and in superb condition. 9" diameter x 3" tall. 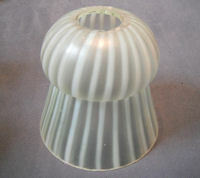 Original, quality 1920's, vaseline coloured glass lamp shade, to fit a standard, modern, UK electric bulb holder. This daffodil trumpet shaped shade has vertical stripes of strong vaseline colour. There are two miniscule chips to the outer rim, otherwise all is complete and in good order. 4" x 4.25" widest. 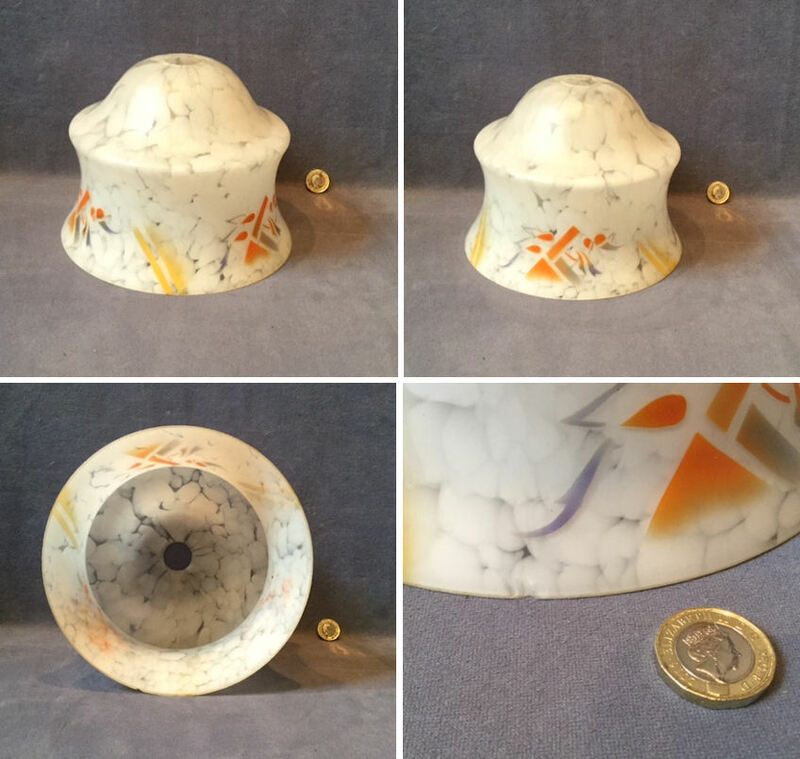 Original, quality 1920's, white glass electric light shade, with an overall painted design in colour to each of the six panels and an orange top section. Will fit a standard, modern, UK electric bulb holder and is complete and in good order. 5.5" tall x 5" widest. 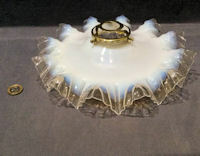 Original, quality, continental glass gas shade, circa 1900, with a strong opaline colour, a vertical ribbing and a wavy outer flanged rim. This shade has been fitted with a replacement, lacquered brass shade holder to fit a standard, modern, UK electric bulb holder and is complete and in good order. 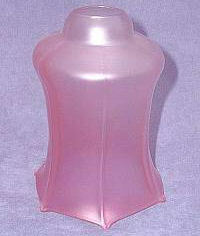 4.75" tall including holder x 6.25" widest. 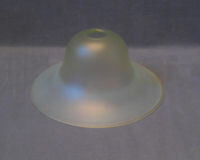 Original, quality 1920's / 30's, larger than normal, frosted glass electric lamp shade of the 'maids bonnet' design, with a wavy outer edge. To fit a standard modern, UK electric bulb holder. 4.5" tall x 8.5" widest. Price is for each. One other identical one may well be available, but a little larger at 8.75" wide, reference code S831. 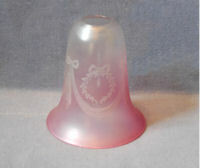 Original, quality 1920's, bell shaped, frosted glass lamp shade, with a cranberry tinted lower half and an etched design of ribbon swags, laurel wreaths and bows. To fit a standard, modern, UK electric bulb holder. Delicate shade, complete and in good order. 4.75" tall x 4.5" widest. 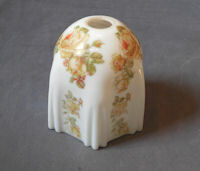 Original, quality 1920's, opaline glass lampshade with transfer decoration of roses. This shade has six panels with flutes between and will fit a standard, modern, UK electric bulb holder. Complete and in good order. 5.25" tall x 5.25" widest. 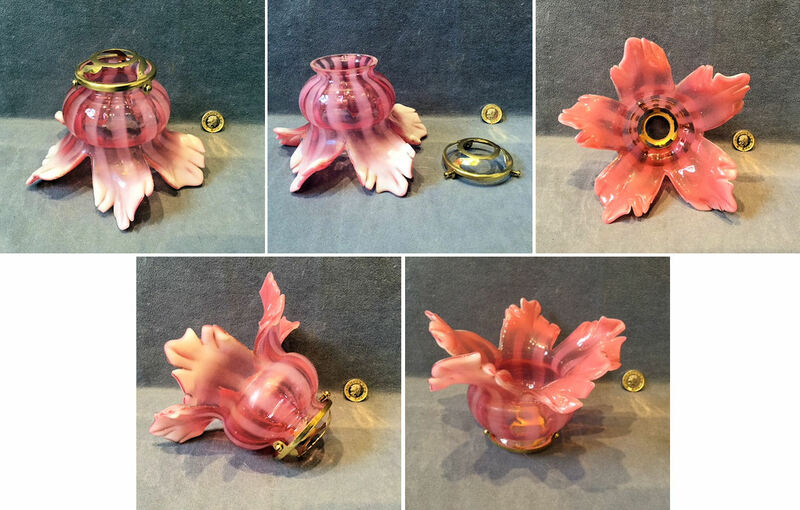 Set of four matching, original, quality 1920's, glass light shades in the form of well detailed flambe shades in frosted glass with a pink and white finish. These shades have been fitted with old gas shade holders drilled out to fit standard, modern, UK electric bulb holders. These also fit old 3.5" gas shades, if required. Each shade holder is impressed "Veritas" for the manufacturer. Have been polished and lacquered, although the lacquer may be removed at no extra cost and are complete and in good order. 7.5" tall including holder and 4.5" widest. Price is for the set. Original, quality 1920's, thin white glass lamp shade fitted with an old brass shade holder to fit a standard, modern, UK electric bulb holder. One small chip to the outer edge polished down, otherwise complete and in good order. 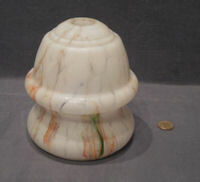 5" tall inculding holder, 5.5" widest. 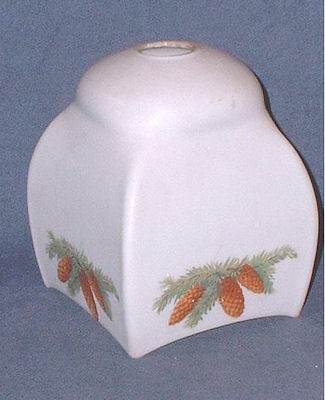 Original, quality 1930's / 40's, opaline coloured glass electric lamp shade in a hexagonal form. Will fit a standard, modern, UK electric bulb holder. This shade is transfer decorated with floral swags and other designs and is complete and in good and working order. 5.5" tall x 4.5" diameter. 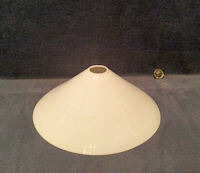 Original, quality 1950's / 60's, egg shaped frosted glass lamp shade, to fit a standard, modern, UK electric bulb holder. This most unusual example has a frosted colour throughout with a blue tinge to the last inch or so and all is splashed in white enamelled squiggles. Complete and in good order. 6.25" tall x 6" widest. 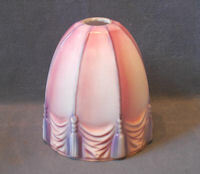 Original, quality 1920's, cranberry tinted glass electric lamp shade of a simple bell form. Will fit a standard, modern, UK electric bulb holder. Complete and in good order. 5.25" tall x 5.25" widest. 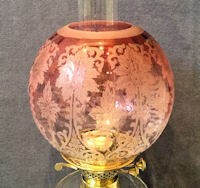 Original, quality, late 19th century, frosted glass continental gas shade with an etched design of acanthus leaves. This shade has been fitted with a replacement, lacquered brass shade holder to fit a standard, modern, UK electric bulb holder and can only be used as an uplighter as the shade holder will not grip this shade. Complete and in good order. 5.75" tall x 4" widest. 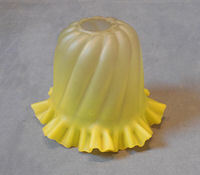 Original, quality 1920's, yellow tinted frosted glass lamp shade, to fit a standard, modern, UK electric bulb holder. 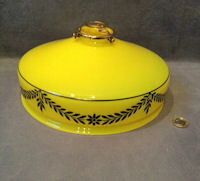 This example has a multi fluted, wavy turned out rim in a strong yellow colour and a diagonal soft ribbing to the body. Complete and in good order. 4" tall x 5.25" widest diameter. Original, quality 1930's, frosted glass lamp shade with white flecks throughout and abstract designs in brown to each of the six panels. Will fit a standard, modern, UK electric bulb holder. Complete and in good order. 5.5" tall x 7" widest. Original, quality 1920's, white glass electric lamp shade with eight simulated panels of curtain like forms with purple cords and tassels. Will fit a standard, modern, UK electric bulb holder and is complete and in good order. 5.5" tall x 5.25" widest. Original, quality 1920's, spherical shaped glass gas shade with a replacement brass shade holder to fit a standard, modern, UK electric bulb holder and an old 2.5" gas gallery, if required. The upper half is frosted and the lower is clear. Complete and in good order. 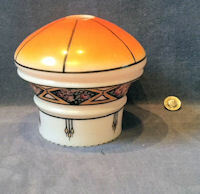 4" tall including shade holder x 4" diameter. 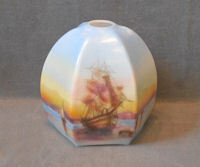 Original, quality 1920's, decorated white glass electric lamp shade with six panels, with a scene over three panels repeated of a galleon type sailing ship at sea. Will fit a standard, modern, UK electric bulb holder and is complete and in good order. 5.5" x 5.5" widest. Original, quality 1920's, decorated on white glass gas light shade with transfer patterns of baskets of flowers with swags and leaves and the original aluminium gas shade holder drilled out to fit a standard , modern, electric bulb holder. 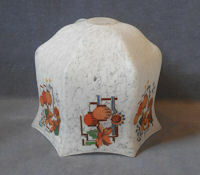 The top of the shade is detailed "Supastone Handpainted" and "Made in Czechoslovakia". Complete and in good order. 6.25" tall including holder and 5.5" widest. Original, quality 1930's, six sided glass electric light shade with transfer decorations of paper lanterns and flowers in colour to each panel, all with a white flecked background colour. Will fit a standard, modern, UK electric bulb holder and is complete and in good order. 5.75" tall x 6.75" widest. 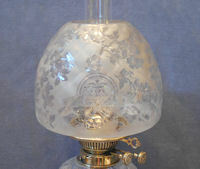 Original, quality, late 19th century, frosted glass gas lamp shade fitted with a replacement, lacquered brass shade holder to fit a standard, modern, UK electric bulb holder. This super example has etched floral decorations of poppies and a cranberry tinted glass overlaid detail. Will also fit an old 3.5" gas gallery, if required amd all is complete and in good order. 5.5" tall including holder and 5.75" widest. Original, quality 1920's, matt finish vaseline glass electric light shade of a simple but unusual form in an Arts and Crafts style to fit a standard, modern, UK electric bulb holder. Complete and in good order. 3.25" tall x 8" diameter. Another similar shade, but smaller, may well be available reference code: S955. Original, quality 1920's, matt finish vaseline glass electric light shade of a simple but unusual form in an Arts and Crafts style to fit a standard, modern, UK electric bulb holder. Complete and in good order. 3" tall x 6.5" diameter. Another similar shade, but larger, may well be available reference code: S954. Original, quality late 19th century spherical shaped clear glass gas lamp shade with the original aluminium gas shade holder drilled out to fit a standard, modern, electric bulb holder. The shade holder is stamped for the manufacturer "Veritas Silvex" and "British Made". Will also fit old 3.5" gas gallery, if required. All is complete and in good and working order. 5.5" tall including shade holder and 5" wide. 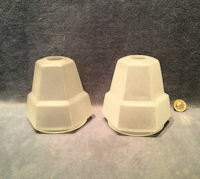 Original, quality pair of 1920's white glass "Coolie Hat" shaped electric light shades, to fit standard, modern, UK electric bulb holders. Super thin, perfect and complete and in good and working order. 10" x 3.5" tall. 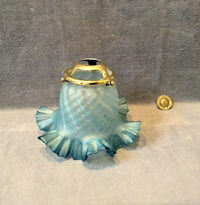 Original, quality 1920's blue glass continental gas lamp shade. This shade has been fitted with a replacement, lacquered brass shade holder to fit a standard, modern, UK electric bulb holder. This example has a quilted body and a frilly out turned outer rim and is complete and in good and working order. 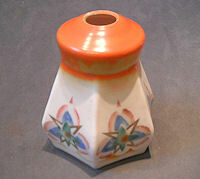 4.25" tall including holder and 5.75" widest. Original, quality 1920's continental gas lamp shade. This shade has been fitted with a replacement, lacquered brass shade holder to fit a standard, modern, UK electric bulb holder. With a clear and embossed body with a good flared out eight pointed outer rim. Complete and in good and working order. 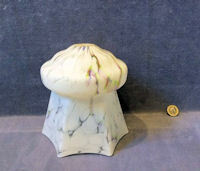 4.25" tall including holder and 6.25" widest. 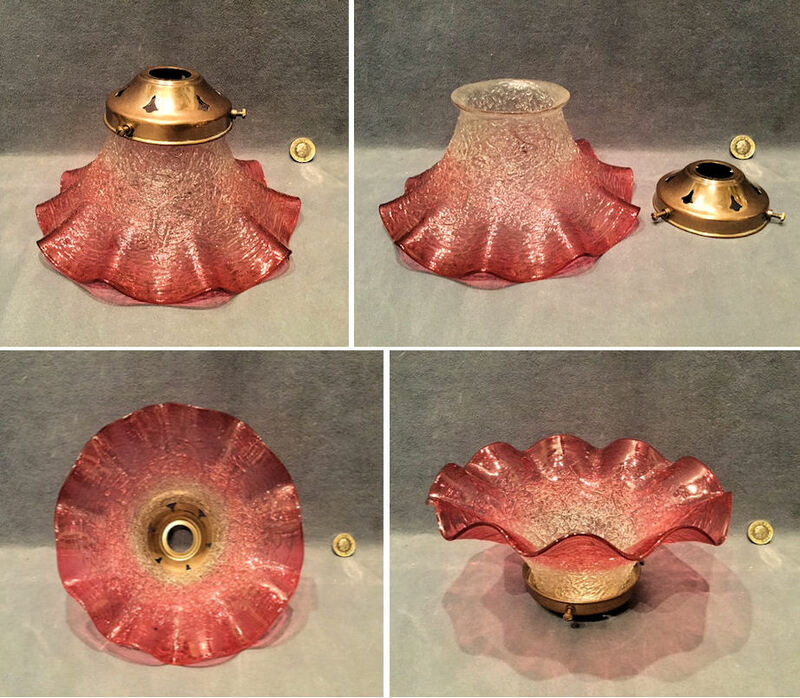 Original, quality circa 1900, cranberry glass continental gas lamp shade with an amazing split petal form and vertical opaline ribbing. This shade has been fitted with a replacement, lacquered brass shade holder to fit a standard, modern, UK electric bulb holder. A most unusual light shade. Complete and in good and working order. 4.25" tall including holder and 6.5" widest diam. Original, quality circa 1900, small cranberry tinted continental gas shade in the shape of a Hibiscus flower, fitted with a replacement, lacquered brass shade holder to fit a standard, modern, UK electric bulb holder. This example has a six soft pointed form with cranberry colour to the frilly outer rim and textured body. Complete and in good and working order. 4" tall including holder and 5.5" widest. Original, quality circa 1900, cranberry tinted continental gas shade, fitted with a replacement, lacquered brass shade holder to fit a standard, modern, UK electric bulb holder. This example has a castellated flared outer rim and a cushion effect in relief to the upper section. Complete and in good and working order. 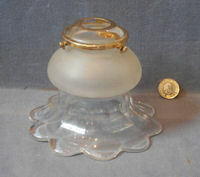 3.75" tall including holder and 6.75" widest. 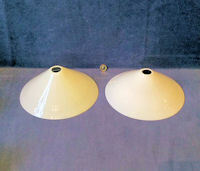 Original, quality very near pair of circa 1900 continental gas shades with an opaline colour. These shades have been fitted with replacement, lacquered brass shade holders to fit standard, modern, UK electric bulb holders. This pair has an eight soft pointed star shape to the lower half and a vertical ribbed section to the upper. Complete and in good and working order. 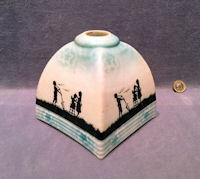 3.5" tall including holder and 6.25" widest. 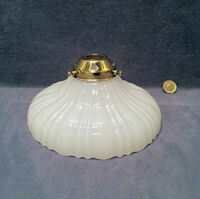 Original, quality circa 1900, continental glass gas shade. This shade has been fitted with a replacement, lacquered brass shade holder to fit a standard, modern, UK electric bulb holder. 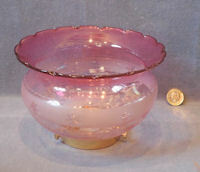 This example has a pebble finish to the cranberry glass body with opaline tube lined decoration to the outer fluted rim. Complete and in good and working order. 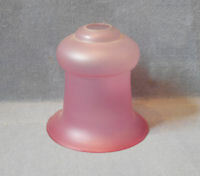 4.25" tall including holder and 5.75" widest. Original, quality 1920's opaline coloured glass continental gas shade, fitted with a replacement, lacquered brass shade holder to fit a standard, modern, UK electric bulb holder. This example has a wavy outer rim with fine ribbing around and an embossed beaded design. Complete and in good and working order. 4.5" tall including holder and 6 .25" widest. 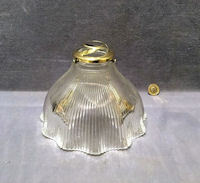 Original, quality 1920's vaseline glass electric light shade, to fit a standard, modern, UK electric bulb holder. 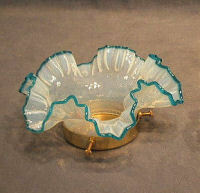 This superb example has a near solid colour of pale green / yellow vaseline glass and a deep wavy outer rim. Complete and in good and working order. 4" tall and 5.75" widest. 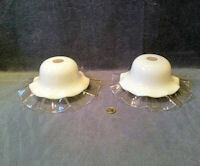 Original, quality pair of 1920's white glass "Coolie Hat" shaped electric light shades. Will fit standard, modern, UK electric bulb holders, super thin, perfect and complete and in good and working order. 9.25" x 3" tall. 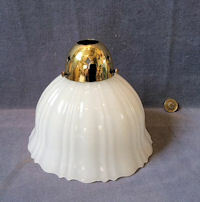 Original, quality 1920's white glass electric lamp shade of an unusual form with the original brass shade holder to fit a standard, modern, UK electric bulb holder. 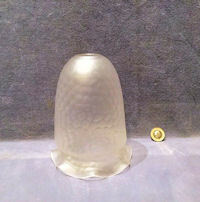 This example has a bell shape with a decorative vertical ribbed design. The shade holder is stamped "Duro Ray No 17 British Made" and has been polished and lacquered, although the lacquer may be removed at no extra cost. All is complete and in good and working order. 5.5" tall and 5" widest. Original, quality 1920's 'maid's bonnet' shape white and clear glass electric light shade with a white glass body with a clear glass frilly outer edges will fit a standard, modern, UK electric bulb holder. Not a blemish in sight and complete and in good and working order. Very similar but larger set of shades may well be available ref code: S210. 6.5" diam and 3.25" tall. 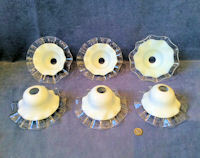 Original, quality set of six matching 1920's 'maid's bonnet' shape white and clear glass electric light shades. This super set has white glass bodies with clear glass frilly outer edges and will fit standard, modern, UK electric bulb holders. Not a blemish in sight and complete and in good and working order. 7" and 3.25" diam. A very similar but smaller shade may well be available ref code: S211. Price is for the set. 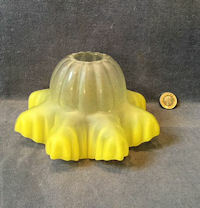 Original, quality 1920's frosted yellow glass electric light shade with an eight soft pointed form with multi frilled edges. The upper section has vertical ribbing and will fit a standard, modern, UK electric bulb holder and the lower section has the strongest yellow colour. Complete and in good order. 3.5" tall and 6.25" widest. 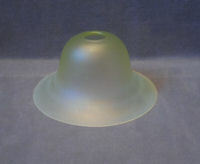 Original, quality moulded glass light shade circa 1910 manufacturerd in thick opalescent coloured glass by Jefferson of Canada for the UK market. 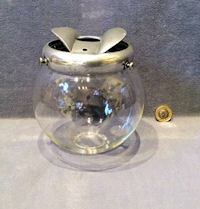 This example is perfect and has a replacement brass shade holder to fit a standard, modern, UK electric bulb holder. Complete and in good and working order. 3.5" tall including holder and 7.5" widest. 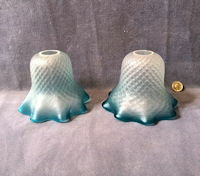 Original, quality pair of multifaceted moulded frosted glass lamp shades manufactured by Holophane circa 1910 / 1920's. This pair have been fitted with replacement lacquered brass shade holders to fit standard, modern, UK electric bulb holders and are the first pair of holophanes we have seen with a frosted finish. All is complete and in good and working order. 5" tall including holders and 7" wide. 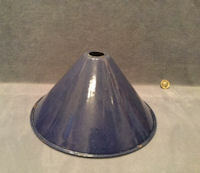 Original, quality 1920's 'Coolie' hat shaped enamel electric light shade with deep blue to the upper surface and white the other. Will fit a standard, modern, UK electric bulb holder and complete and in good and working order. 5" tall and 10" diam. 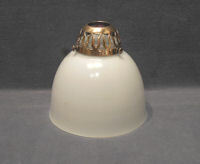 Original, quality 1920's white glass 'Coolie' hat shaped electric light shade. Will fit a standard, modern, UK electric bulb holder, super thin, perfect and complete and in good order. Various sizes available 1 x 8" x 2.5" tall. 1 x 8.75" x 3" tall. 1 x 9" x 3" tall. 2 x 9.25" x 3" tall. 1 x 9.5" x 3.5" tall. 2 x 9.75" x 3.25" tall. 1 x 10" x 3.5" tall. If ordering online, please state which size is required. Price is for each. 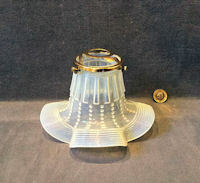 Original, quality 1920's continental white glass coolie hat shaped gas lamp shade with a clear glass multi frilled outer rim. This shade has been fitted with a replacement, lacquered brass shade holder to fit a standard, modern, UK electric bulb holder. Complete and in good order. Original, quality, circa 1900, continental opaline coloured glass gas lamp shade with a flared body with serrated edges to the pointed ends. This shade has been fitted with a replacement, lacquered brass shade holder to fit a standard, modern, UK electric bulb holder. Will also fit an old 3.5" gas gallery if required. Complete and in good order. 4" tall including holder and 5.5" diam. 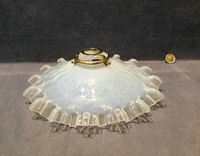 Original, quality moulded glass light shade, circa 1910, manufactured in thick opalescent coloured glass by Jefferson of Canada for the UK Market. 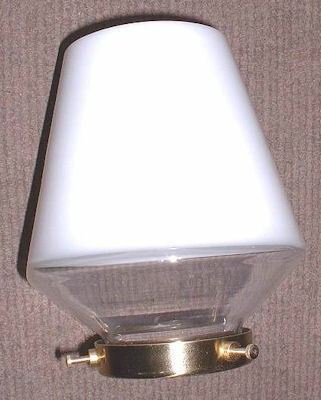 This example has the original brass shade holder to fit a standard, modern, UK electric bulb holder. The brass has been polished and lacquered, although the lacquer may be removed at no extra cost and all is complete and in good and working order. 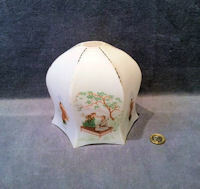 5.75" tall including holder and 7.25" widest. 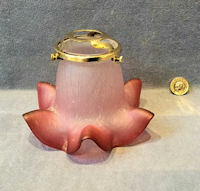 Original, quality moulded glass light shade, circa 1910, manufactured in thick opalescent coloured glass by Jefferson of Canada for the UK Market. 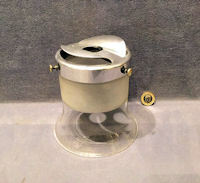 This example has the original brass shade holder to fit a standard, modern, UK electric bulb holder. The brass has been polished and lacquered, although the lacquer may be removed at no extra cost and all is complete and in good and working order. 7" tall including holder and 7.75" widest. Original, quality, set of five matching moulded glass electric light shades, circa 1910, manufactured in thick opalescent coloured glass by Jefferson of Canada for the UK Market. This set of small Jefferson shades are perfect and have been fitted with replacement brass shade holders to fit standard, modern, UK electric bulb holders. The brass has been polished and lacquered, although the lacquer may be removed at no extra cost and all is complete and in good and working order. 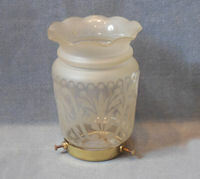 4.25" tall including holder and 5.25" widest. Price is for the set. Original, quality pair of 1920's / 30's blue tinted glass electric lamp shades with a quilted pattern overall in relief and a wavy outer rim in the deepest blue. These examples will fit standard, modern, UK electric bulb holders and are complete and in good and working order. 4.5" tall x 5.5" widest. 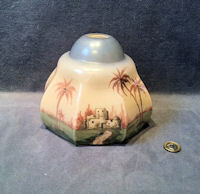 Original, quality 1920's / 30's white glass shade decorated with a scene with a cottage and another of sailing boats at sea. This example will fit a standard, modern, UK electric bulb holder and has the upper half in bold orange and the scene on white below. Complete and in good and working order. 5.75" tall and 5.75" widest. 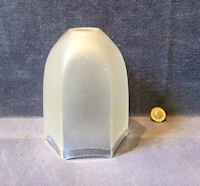 Original, quality 1930's / 40's embossed frosted glass electric lamp shade, to fit a standard, modern, UK electric bulb holder. This art deco styled shade is simulating a cloth shade in shape and is complete and in good order. 5.5" tall x 5" widest. Original, quality set of three matching identical 1920's white glass 'coolie' shades. 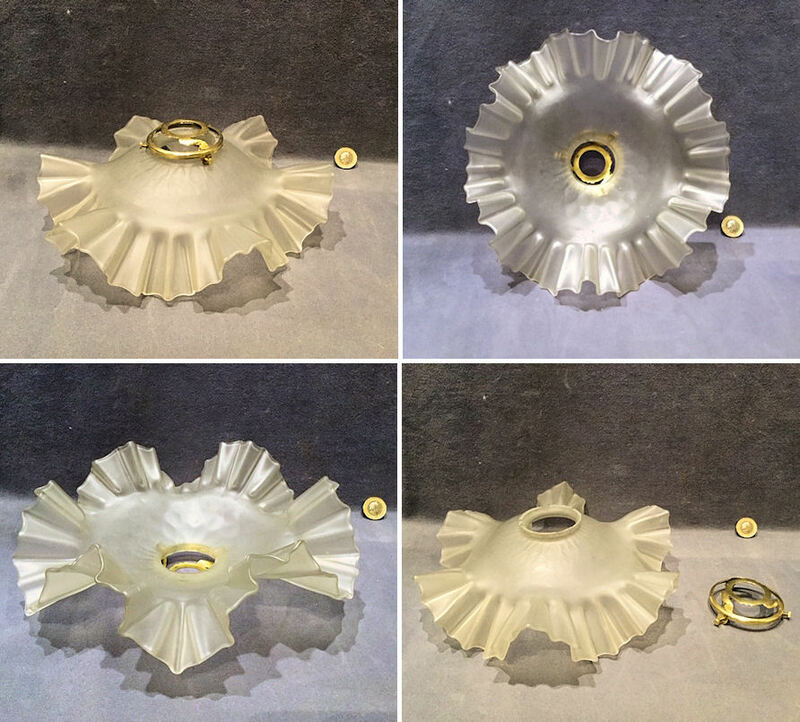 Will fit standard, modern, UK electric bulb holders, these most unusual examples are in the super thin glass but have a wavy outer rim instead of the plain rim. Complete and in good order. 4" tall and 9" diam. Price is for the set. Original, quality circa 1900, white glass gas light shade with a lustre colour to the upper part and decorative roundels to the lower, with the original aluminium gas shade holder drilled out to fit a standard, modern, electric bulb holder. Will also fit an old 3.5" gas gallery if required. Complete and in good order. 6.25" tall including holder and 6" widest. 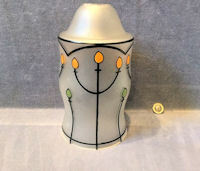 Original, quality 1920's / 30's white glass electric lamp shade decorated with Art Deco transfer designs and an orange top. Will fit a standard, modern, UK electric bulb holder. Complete and in good and working order. 5.5" tall and 6.5" widest. 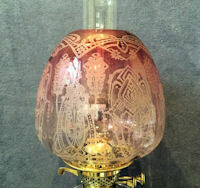 Original, quality late 19th century cranberry tinted etched and frosted gas lamp shade. With the original aluminium gas shade holder drilled out to fit a standard, modern, electric bulb holder, will also fit an old 3.5" gas gallery, if required. 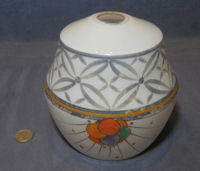 This example has a wavy and flared outer rim with abstract etched vertical designs. Complete and in good and working order. 5.75" tall including holder and 6" widest. Original, quality 1920's continental yellow glass electric lamp shade decorated with a black transfer design of laurel leaf swags and fitted with a replacement, lacquered brass shade holder to fit a standard, modern, UK electric bulb holder. Complete and in good and working order. 10" wide and 4.75" tall including holder. 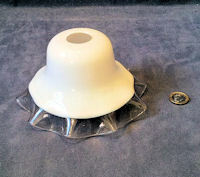 Original, quality 1920's white glass 'coolie' hat shaped electric light shade, super thin and perfect. Will fit a standard, modern, UK electric bulb holder. 4.25" tall and 11.5" diam. 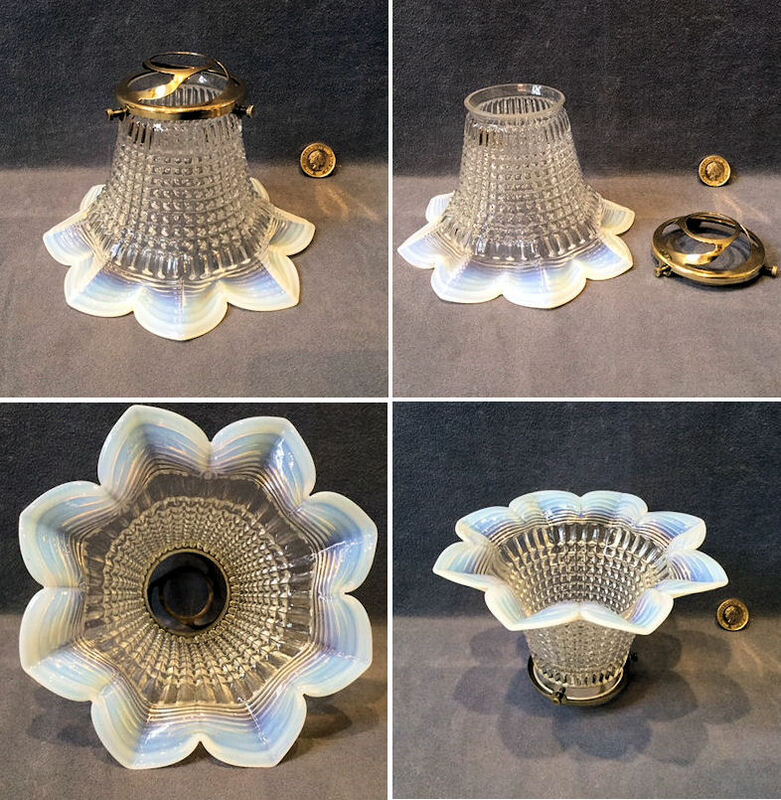 Original, quality 1920's bright opaline coloured glass electric light shade of the bluebell shape with a deep wavy outer rim, to fit a standard, modern, UK electric bulb holder. Complete and in good and working order. 4.25" tall and 6.5" widest. 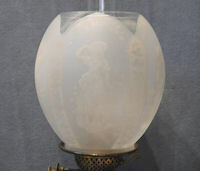 Original, quality late 19th century acid etched frosted glass gas light shade. This shade has been fitted with a replacement, lacquered brass shade holder to fit a standard, modern, UK electric bulb holder and will also fit an old 3.5" gas gallery, if required. This unusual example has designs of anemones and an inverted wavy rim. Complete and in good order. 4.5" tall including holder and 5" widest. 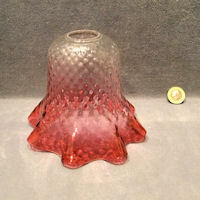 Original, quality late 19th century cranberry tinted glass lamp shade with a crackle finish to the upper surface. The good frilly outer flange is in bold cranberry colour fading out to clear. This shade has been fitted with a replacement, lacquered brass shade holder to fit a standard, modern, UK electric bulb holder. This modern replacement shade holder is in a 'bronzed' finish, but we could polish it back to shiny brass on request at no extra cost. Complete and in good order. 4.25" tall including holder and 8" widest. 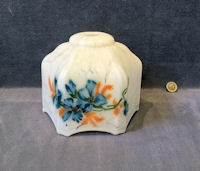 Original, quality late 19th century continental opaline tinted gas shade. This shade has been fitted with a replacement, lacquered brass shade holder to fit a standard, modern, UK electric bulb holder. Complete and in good order. 4" tall including holder and 6" widest. 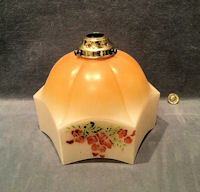 Original, quality orange decorated glass electric light shade. Will fit a standard, modern, UK electric bulb holder. This bright 1930's / 40's example has eight panels with blue and green decoration beneath and a wavy outer rim. Complete and in good order. 6" tall and 5.5" widest. 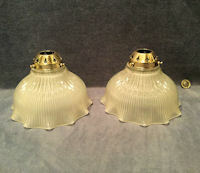 Original, quality pair of 1920's clear and white glass electric lamp shades in the shape of maids bonnets. The upper section is in white and the lower wavy rim is clear. Will fit standard, modern, UK electric bulb holders. Complete and in good order. 9" diam and 3.5" tall. 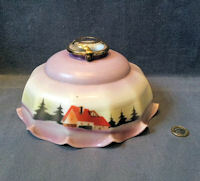 Original, quality 1920's / 30's white glass electric light shade of a shallow decorated form with a frilly outer rim and coloured decoration of a cottage with fir trees, all on a lilac on white background. This shade has been fitted with a replacement, lacquered brass shade holder to fit a standard, modern, UK electric bulb holder. Complete and in good order. 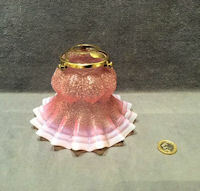 4.5" tall including shade holder and 9" diam widest. 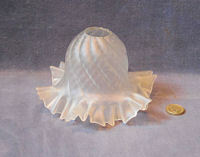 Original, quality 1920's white pressed glass lamp shade with soft vertical ribs. This shade has been fitted with a replacement, lacquered brass shade holder to fit a standard, modern, UK electric bulb holder and is complete and in good order. 5" tall x 5.5" widest. Original, quality 1930's white glass electric light shade with six panels, each with a coloured detail of Japanese musicians and dancers. Will fit a standard, modern, UK electric bulb holder and is complete and in good order. 5.25" tall x 6" widest. 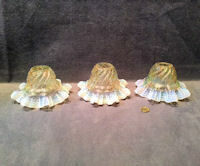 Original, quality set of three 1920's electric light shades with multi wavy flared outer rims in opaline coloured glass and dome shaped upper sections with a flecked finish on a diagonal embossed pattern. Will fit standard, modern, UK electric bulb holders and are complete and in good order. 3.75" tall and 6.5" widest. Price is for the set. 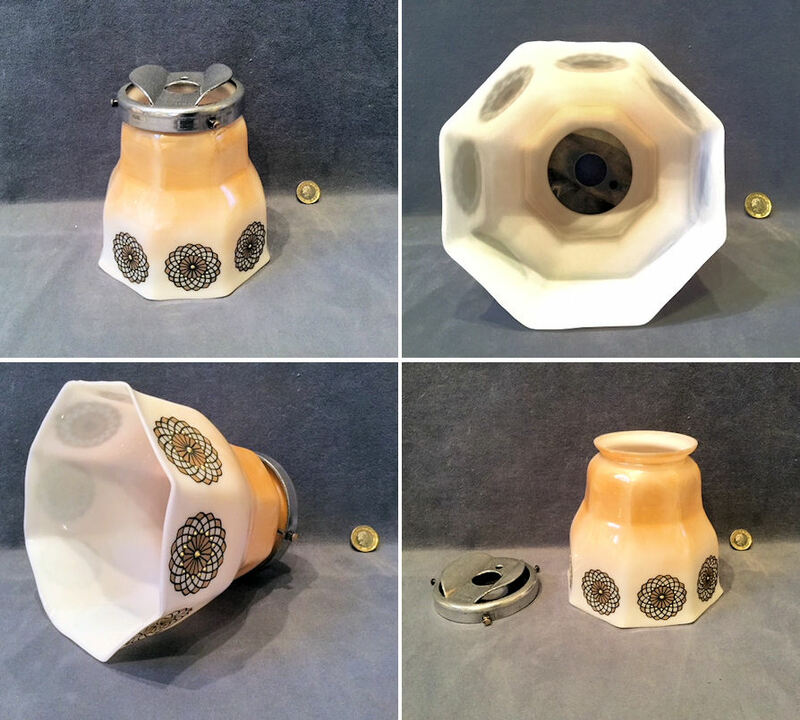 Original, quality 1930's hexagonal shaped larger than average, glass lamp shade with an orange upper sections and floral panels alternating to the lower, with the original brass shade holder. Polished and lacquered, although the lacquer may be removed at no extra cost and all is complete and in good order. 7.25" tall including holder and 9" widest. Original, quality 1920's pressed white glass electric light shade with swags in relief and to fit a standard, modern, UK electric bulb holder. Complete and in good and working order. 5.25" tall and 6" widest. 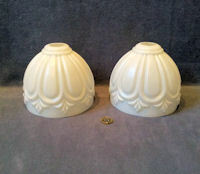 Original, quality pair of 1930's embossed white glass electric lamp shades. To fit standard, modern, UK electric bulb holders. These examples have a petal shape embossed design and are striking when lit up. Complete and in good order. 5" tall and 5.75"diam. 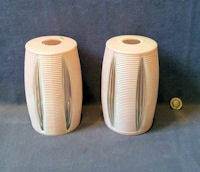 Original, quality pair of 1930's frosted glass electric light shades in the Art Deco manner. These examples will fit a standard, UK electric bulb holder and do have a few scuffs and scratches but otherwise complete and in good order. 4.5" tall and 4.5" widest. 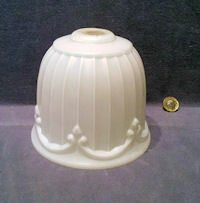 Original, quality 1920's white glass lamp shade, to fit a standard, modern, UK electric bulb holder. This unusual example has four sides with pale blue to the upper and lower sections each decorated with a repeated silhouette of three children. Complete and in good order. 5.25" tall and 5.25" widest. Original, quality circa 1900, etched and frosted clear glass gas shade, with the original aluminium gas shade holder drilled out to fit a standard, modern, electric bulb holder. This super example has etched swags to the top and a laurel wreath style design to the cylindrical body. An unusual shape shade. Will also fit an old 3.5" gas gallery if required. Complete and in good order. 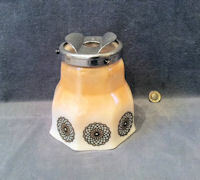 7.25" tall including holder, 4" diam base and 4.25" widest. Original, quality set of four matching circa 1900, continental frosted glass gas lamp shades with a textured 'pebble' finish on a six panelled body. These shades have been fitted with replacement, lacquered brass shade holders to fit standard, modern, UK electric bulb holders. Complete and in good order. 5.75" tall with holder and 4.25" widest. Price is for the set. 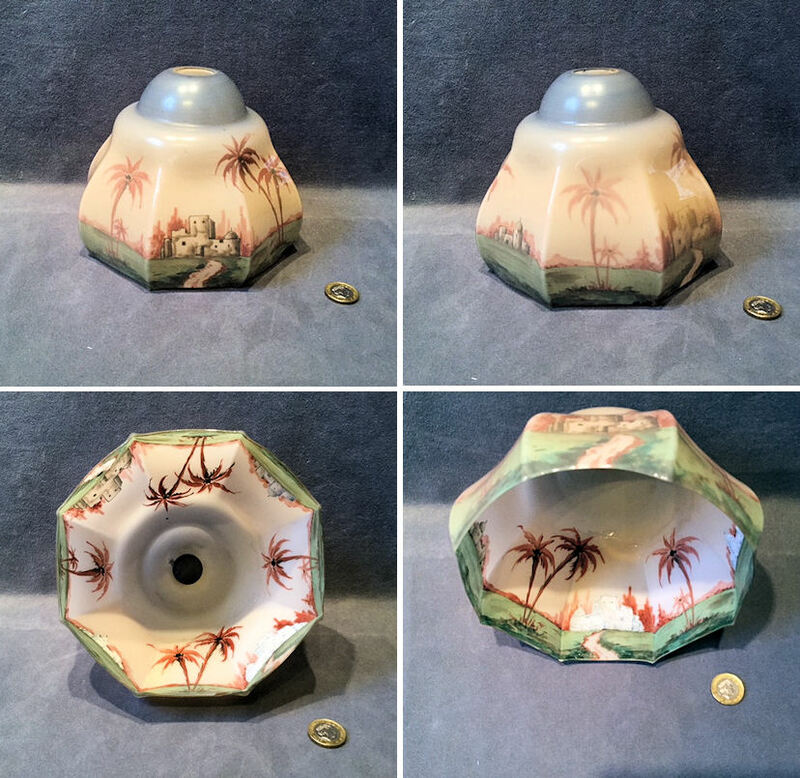 Original, quality 1920's / 30's glass light shade, hand decorated to the inside with Arabic scenes in colour of dwellings and palm trees which 'come to life' when lit up. To fit a standard, modern, UK electric bulb holder. This shade has eight panels and a scalloped lower rim. Most unusual and complete and in good order. 5.5" tall x 7.5" widest. 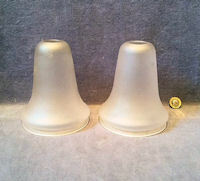 Original, quality pair of 1950's / 60's glass light shades. To fit standard, modern, UK electric bulb holders. This late but interesting pair are very stylish of the period and have moulded ribbing all round with vertical clear panels. Complete and in good order. 6" tall and 3.5" widest. 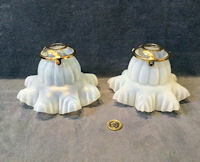 Original, quality pair of 1920's frosted glass light shades in the Art Nouveau style to fit standard, modern, UK electric bulb holders. Complete and in good order. 5.75" tall and 5" widest. 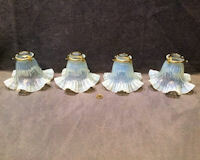 Original, quality set of eight matching moulded glass electric lamp shades circa 1910, manufacturer in thick opalescent coloured glass by Jeffersons of Canada for the European Market. This set of eight, a really good run, are perfect and have replacement brass shade holders to fit a standard, modern, UK electric bulb holder. The brass has been polished and lacquered, although the lacquer may be removed at no extra cost and all is complete and in good order. 5" tall including holder and 6" widest. Price is for the set. 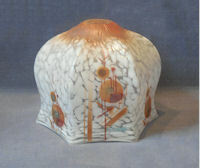 Original, quality 1930's larger than average glass lamp shade. This example is marbled white on frosted with Art Deco transfer decoration. One chip to the outer rim polished down, otherwise complete and in good order. Will fit a standard, modern, UK electric bulb holder. 6.25" tall and 8" diam. 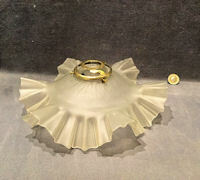 Original, quality 1920's clear glass continental gas shade in the form of a flower head. This shade has been fitted with a replacement lacquered brass shade holder to fit a standard, modern, UK electric bulb holder. The top section is frosted and the lower petal shaped is clear. No chips or cracks and complete and in good order. 4.25" tall including holder and 5.5" widest. 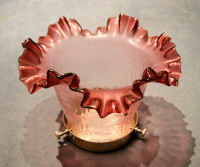 Original, quality late 19th century cranberry tinted glass gas shade. This shade has been fitted with a replacement, lacquered brass shade holder to fit a standard, modern, UK electric bulb holder the lacquer can be removed at no extra cost. This super example has etched designs of fern leaves to the clear section, cut glass stars around the middle and a frilly out turned top cranberry section. A most unusual size and ideal for either uplighter or down. Complete and in good and working order. 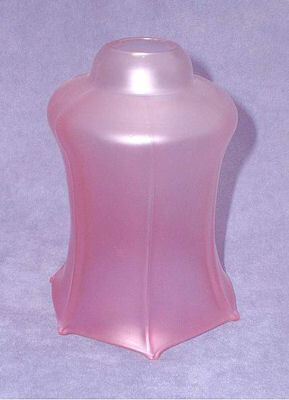 4.25" tall including holder and 6.75" widest. Set of three matching 1920's/30's white glass electric light shades each with six panels of pink overlay and transfer details of swags of flowers. To fit standard, modern, UK electric bulb holders and complete and in good order. 6" tall and 6" widest. Price is for the set. Original, quality 1920's bell shaped vaseline coloured glass lamp shade with a super clean finish but with a chip to the outer flanged rim. The chip has been polished, and although still visible it is not sharp or large. Otherwise complete and in good order. Will fit a modern standard UK bulb holder. 5.25" tall x 5" diam. 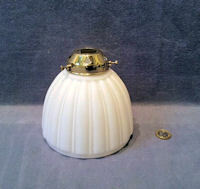 Original, quality 1920's white glass electric light shade with an unusual embossed design overall. Will fit a standard, modern, UK electric bulb holder. 5" tall and 4.75" diam. Complete and in good order. Click on pohoto for larger and other view. 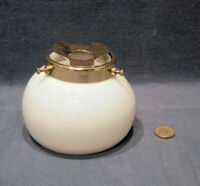 Original, quality continental frosted glass gas light shade circa 1900. This shade has been fitted with a replacement, lacquered brass shade holder to fit a standard, modern UK electric bulb holder. This example has an embossed decoration overall, a wavy flared outer rim and is complete and in good order. 5" tall x 6" widest. Original, quality pair of 1920's coolie hat shaped enamelled electric light shades with a dark blue upper surface and a white interior. Some minor chips and some staining to the blue on one shade otherwise in superb order and complete.10" diam and 3.5" tall. 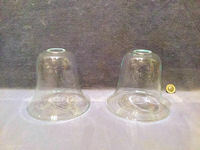 Original, quality pair of 1920's maid's bonnet shaped glass lamp shades, will fit standard, modern, UK electric bulb holders. 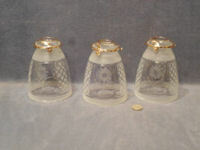 These larger than average examples have a white domed upper half with a wide clear glass flange with a wavy edge. 10.25" diam and 4" tall. 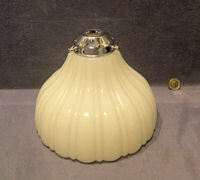 Original, quality 1920's/30's white glass electric light shade, to fit a standard, modern, UK electric bulb holder. 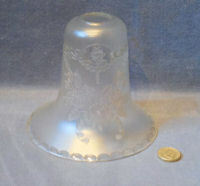 This example is decorated in colour to the lower half and in grey lined decoration to the upper, the top is etched "B C M Hailglass" and "British made". Complete and in good order. 6" tall and 6" widest. 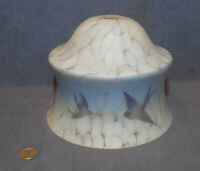 Original, quality 1920's/30's white marbled glass electric lamp shade decorated around with swallows in flight. Will fit a standard, modern, UK electric bulb holder. Some very minor chips to the outer rim otherwise complete and in good order. A little larger than average for this style of shade. 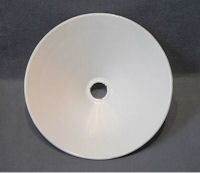 6" tall and 7.75" diam outer rim. 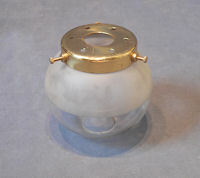 Original, quality 1920's continental white glass spherical shaped gas lamp shade, fitted with a replacement, lacquered brass shade holder to fit a standard, modern, UK electric bulb holder. Complete and in good order. 4" tall including holder and 4.5" widest. Original, quality orange and white gas lamp shade circa 1900, with the original aluminium gas shade holder drilled out to fit a standard, modern, electric bulb holder. 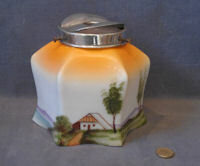 This bright example has been hand painted with a scene of a cottage with trees and hills behind. Will also fit old 3.5" gas gallery, if required. The shade holder is impressed for the "Cardiff Gas Company" and "British Made". Complete and in good and working order. 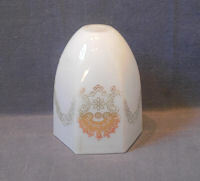 6.25" tall including holder and 6.75" widest. Original, quality 19th near pair century continental opaline tinted glass gas shades, fitted with a replacement, lacquered brass shade holders to fit a standard, modern, UK electric bulb holders. 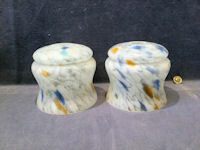 This near pair only differs in the overall width and otherwise are identical with an opaline coloured body fading to clear glass to the multi frilly outer rim. All is complete and in good and working order. 4" tall including holder and 6.25" widest. 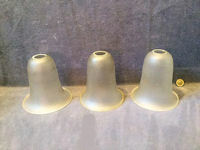 Original, quality set of three matching 1920's continental glass lamp shades, fitted with replacement, lacquered brass shade holders to fit standard, modern, UK electric bulb holders. These pretty shades have a frosted top and base section with three clear panels with engraved and cut flower designs. Complete and in good and working order. 5" tall including shade holder and 4" widest. Price is for the set. 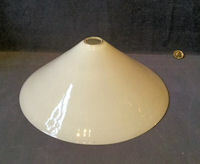 Original, quality 1920's frosted glass lamp shade to fit a standard, modern, UK electric bulb holder. This example has a quilted effect embossed to the body and a frilly and wavy flared outer rim and is complete and in good order. 3.75" tall and 6" widest. 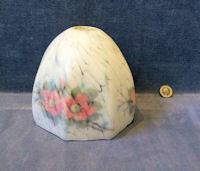 Original, quality 1920's white glass lamp shade, with a pink fading down to yellow overlay and hand painted 'roses' decoration to the lower white section. This shade is fitted with a replacement, lacquered brass shade holder to fit a standard, modern, UK electric bulb holder and all is complete and in good order. 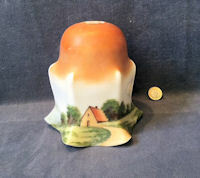 6.75" tall including holder and 9" widest. Price is for each. Original, quality 1920's etched and frosted glass bell shaped, electric light shade to fit a standard, modern, UK electric bulb holder. 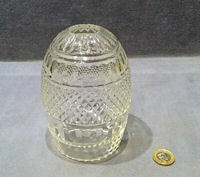 This super example has swags of etched flowers, with clear glass inset panels giving off spots of clear light. Complete and in good order. 4.75" tall and 5.5" diam widest. 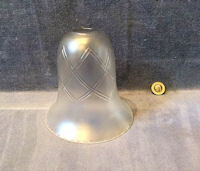 Original, quality 1920's frosted glass bell shaped lamp shade to fit a standard, modern, UK electric bulb holder. This example has a wavy outer cranberry tinted rim and an embossed design of laurel leaf swags. Complete and in good order. 4.75" tall and 5.5" widest. 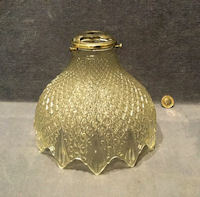 Original, quality 1920's, "beehive" shaped clear glass oil lamp globe with a frosted and embossed upper section and an etched design of oak leaves and acorns to the lower. Will fit a standard, duplex double wick burner gallery and is complete and in good order. 7.25" tall x 7.5" widest and lower aperture 4". 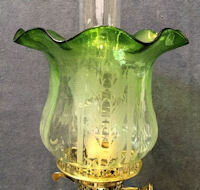 Original, quality late 19th century green tinted glass oil lamp shade with a flared out wavy top section in bolder green fading downwards. The main body section has Art Nouveau designs of flowers and leaves. Will fit a standard, duplex double wick burner gallery. One minor blemish but no chips or cracks, otherwise complete and in good order. 7" tall x 8" widest and 3.75" lower aperture. 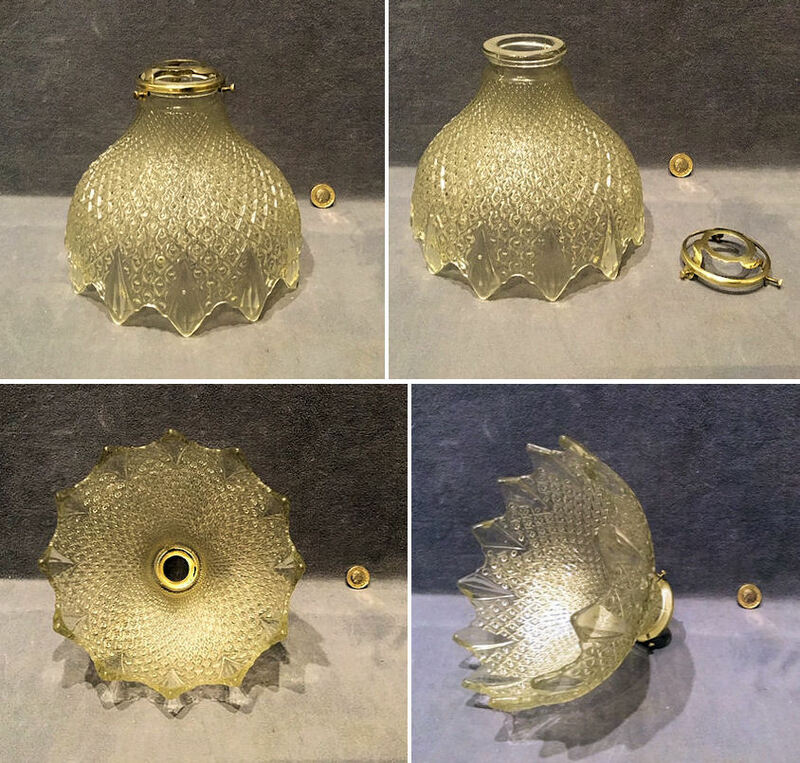 Original, quality late 19th century amber tinted glass oil lamp shade, with a fluted top section flared out and a beehive shaped lower, acid etched with fan shaped patterns. Will fit a standard, duplex double wick burner gallery and is complete and in good order. 8.25" tall x 6.5" widest and 3.75" diam lower aperture. 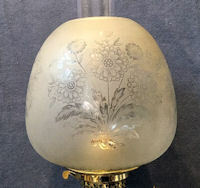 Original, quality circa 1900, "Beehive" shaped clear glass oil lamp shade with Art Nouveau designs of 'Scabious' plants with flowers on a frosted background. Will fit a standard, duplex double wick burner gallery and is complete and in good and working order. 7.25" tall x 8" widest and lower aperture 4". 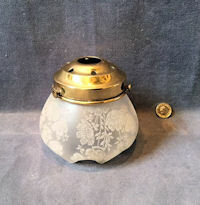 Original, quality late 19th century "Beehive" shaped clear glass oil lamp globe with a frosted upper section and etched Art Nouveau designs beneath. Will fit a standard, duplex double wick burner gallery and is complete and in good and working order. 6.5" tall x 8" widest and lower aperture 4". 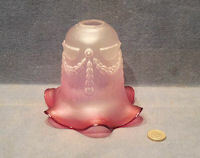 Original, quality late 19th century cranberry tinted glass oil lamp shade of the "Beehive" shape with etched Art Nouveau designs. Will fit a standard, duplex double wick burner gallery and is complete and in good and working order. 7.5" tall x 8" widest and lower aperture 4". 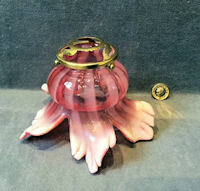 Original, quality late 19th century cranberry tinted glass oil lamp shade with etched Art Nouveau flower designs. Will fit a standard, duplex double wick burner gallery and is complete and in good and working order. 7" tall x 8" diam and lower aperture 3.75". 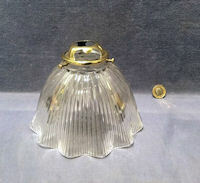 Original, quality 1920's white glass oil lamp shade with a clear glass underside. Will fit a standard, duplex double wick burner gallery. Complete and in good and working order. 8.25" tall, 8.5" widest and 4" diam lower aperture. Price is for each. Original, quality 1920's spherical shaped frosted glass oil lamp globe to fit a standard, duplex double wick burner gallery. This plain but clean example has a clear section to the base and the main is in a frosted finish. All is complete and in good and working order. 7" tall and 8" diam, lower aperture 4" and upper aperture 3.25". 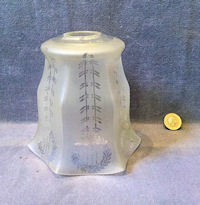 Original, quality, late 19th century, 'beehive' shaped etched clear glass oil lamp shade to fit a standard, duplex double wick burner gallery. This example has a quilted surface overall and is acid etched with designs of flowers and abstract Japanesque forms. Two very minor inner chips to the top rim otherwise complete and in good order. 6.75" tall x 8" widest, lower aperture 4". 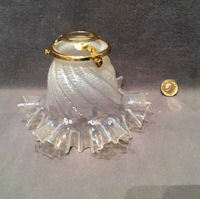 Original, quality, ovoid shaped, etched and frosted clear glass oil lamp shade, circa 1900/1920's, will fit a standard, duplex double wick burner gallery. The etched design details five panels, each with a classical figure. A most unusual oil shade, complete and in good order. 7.5" tall, 6.5" widest + 4" lower aperture. 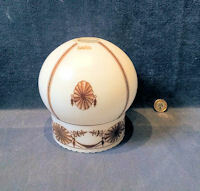 Original, quality, 1920's amber coloured glass oil lamp globe, decorated overall with daisy designs. Will fit a standard duplex double wick burner gallery and is complete and in good order. 7"tall + 7" widest + 4" lower aperture.